American flash storage vendor Nimbus Data has launched a traditional 3.5-inch solid state drive (SSD) with 100TB of capacity – the largest storage drive ever made. The ExaDrive DC100 uses patent-pending multiprocessor architecture to cram more 3D NAND chips into its casing, and as a result, promises space savings, lower power consumption per TB and lower operating costs. A single server rack of such SSDs can deliver more than 100PB of raw storage capacity – even more if deduplication and compression are applied. And being a SATA drive, the device is compatible with hundreds of existing storage and server platforms. 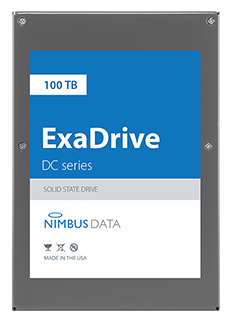 According to Nimbus Data, the ExaDrive DC100 has been optimized for efficiency – so don’t expect it to break any performance records. On the other hand, the company says additionalcapacity has enabled it to improve flash longevity, so the device is protected by an “unlimited endurance guarantee” for 5 years. “The release of such a high capacity flash device that is fully compatible with HDD form factors opens up the opportunity to turbo charge big data platforms while at the same time improving reliability, significantly reducing device count, increasing data mobility, and lowering the TCO of multi-PB scale storage platforms,” commented Eric Burgener, research vice president of Storage at IDC. The ExaDrive DC100 is currently sampling to strategic customers and will be generally available in summer 2018.